Vineet Agarwal is Co Founder and Partner – T10, a sports apparel brand that is an integral part of biggest running events in India. T10 Sports had been a garment exporter since 1995 working for major buyers like GAP. But in 2010, 3 founders of T10 decided to ditch all of that and create his own brand in sportswear and that’s when T10 happened. Incidentally, Vineet started running after his launched his new organisation. He has done Comrades – 2015, Ironman Sweden – 2016, Bhatti 160km and 220km. While on my very early morning runs, I often bump into Vineet, running and is filling his morning running cup. I recently found out that this very unassuming guy is almost an Ultraman. yes, Almost and not entirely! So i get curious, call him and ask him if that is true and if yes – then i must do a blog on him. Wanting to get away from this topic, he says ok and keeps the phone down. I chase him for a few days and he evades me. But here we are finally on Vineet, his almost an Ultraman Title and how did he start T10. It was an emotionally tough phase when Vineet decided to distract himself and sign up for the Ultraman Australia. Already an Ironman, it was a deep itch to challenge his limits. Here’s an account my Vineet on his Ultraman DNF. Was signing up for Ultraman easy? I had already missed the registration dates for 2017. I wasn’t ready to wait for Ultraman Hawai and Florida which were 11 months away. I sent repeated mails, tried to use influence in Australia, but all in vain. Then finally around end march, one night I was a little tipsy and emotionally low, I shot out an emotional e- mail, truthfully stating my state of mind and conveyed that I am passing through a bad phase of life and this event can uplift me and give me something positive to work upon. I think it struck a chord with the event organizers and they responded positively. I got an invitation mail from Dayle (Event Coordinator). 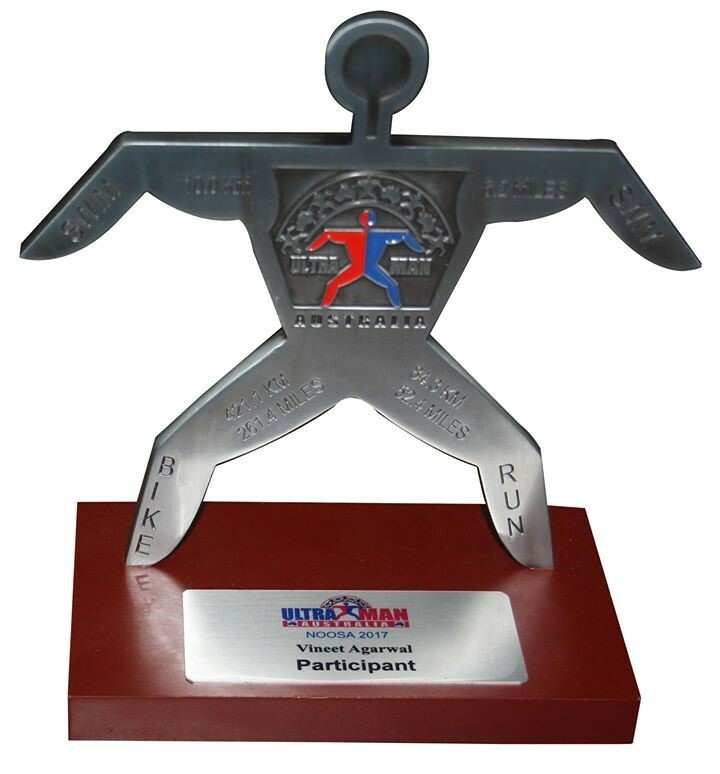 I had the registration, but was I ready for an Ultraman ??? I wasn’t thinking logically – I felt Ultraman is doable as we get a break of almost 12 hours on each day, but was I ready ?With 43 hours – 226km of running & 1 Ironman under my belt – I told myself – I will Do It! I had 30-35 days to train. I hadn’t cycled or swum post Ironman way back since Aug 2016, running was happening, but again nothing compared to what was required. It was time to turn to seek help from experts, I contacted my dear friend and coach Deepak Raj who is based in Australia and asked him to give me a – 30 days crash course to prepare for the Ultraman. He was supportive enough, but that’s where it ended, he sent me a great program. But that’s what the beauty of whole thing was; it took my mind off from whatever I was feeling. It rained heavily. The constantly lashing rains and wind made the sea choppy … the only inspiration was my peddler, she was a 14-15 year girl and she took zig zag routes and ended up doing 10.75 km swim. I was swimming at an average pace of 25-26 minutes / km till 7 k. Drinking sea water can make your head spin….nobody told me that till it really did. Around 8 k wanted to quit, but I remembered that I was there because I chose to be there. So I put my head down, keeping an eye on 6 hrs. cutoff time. And then suddenly I completed the distance…5.06 hours ( an encouraging 54 minutes before cut off) Was both relieved and wet…. took around 25 mints transition time from being a mermaid to cycle Wala…. It was now time for the next challenge, cycling for 145 km. The hills started after 8km and I knew I was in for a roller coaster ride. The head was still spinning, faster than the spinning speed of my cycle….it bothered me till about 80 km and then suddenly I was feeling better…it must’ve given up coz I wasn’t giving up!!! I had to walk the big steep hills as I had never experienced riding on such monstrous inclines ever earlier. Having managed the cutoffs for the day, I was feeling good and strong…looking forward to good sleep and the grind of Day -2. Did I tell you, I lost my way during the ride, but recovered early enough …and this is something that is going to bother me in days to come! Fresh from the rest, I was ready for the 275 km challenge, unmindful of the events which were about to unravel. It was going to be a full day on cycle!! I was able to keep pace with the other cyclists, though not really with them but felt good enough to keep them in sight, considering I was the only inexperienced cyclist there. I kept an average pace of 26-27 km / hour till about 100 km, perfectly as per my mental script. And then things began to change, primarily was so focused on maintaining the tempo, I took a wrong turn at 105 k, which led me to a steep climb of around 1.5 km. I realized this when I heard frantic honking of my crew car, they guided me back on the track. I lost precious time and energy going up the steep hill and not to mention my rhythm was broken. I was now alone on the route… If that was not enough to bring down my spirits another test awaited me…At 140 k there was a rough patch of road and steep downhill coupled with a tight turn got better of my inexperience in controlling the disagreement of two wheels as they wanted to go in different directions and when that happened obviously I crashed and landed up on gravel. The nasty fall brought me on my all four limbs, injured my elbow, palms, hip bone etc. Since the cycle was ok and I was still in single piece, I crawled back on the saddle. I paid no heed to the aching seat, but due to my elbow injury, I could not use the aero bars which were so very important for the correct posture and long rides. The freaking hills were never ending. Despite my best efforts, the wrong turn and the injury due to crash contributed towards 12 km deficit at the end of stipulated 12 hrs. to complete the distance. I must also admit that It made me feel I was under trained and wasn’t a good rider to negotiate those hills. I woke up with severe pain in the hip bone which was much more than the pain due to imprints of the cycle seat. But nothing could deter me from completing the event. I targetted a slow run. Decided to use every bit of time right till the cutoff. Mentally I knew that even if I Crawl , I will finish my run …Navigation continued to be my Waterloo, I think the mental GPS had taken leave during those three days, I ended up Losing my way by at least half a dozen time if not more …I need to get it fixed ASAP, reboot and reconfigure! I ended up running 87.65 km (against 84.3k). I felt strong though my shoes gave up somewhere during the last part of the run, so with little choice I ran last 5-6km barefoot and did a strong finish in little over 11 hrs., well before the cutoff. Looking back, the running route was totally about rolling hills, steep inclines and did I say I even bothered to look at the scenery….naah it didn’t bother me as much as the inclines did, so all I remember is going up more coming down little less!! I was amazed when the Race Director garlanded me with a medal, usually they don’t if one has a DNF in any part. Anyways, with no time to ponder upon then, and it was a sheer joy to see the metal hanging around me at finish line. The Award ceremony on day 4 was amazing as people shared their experience….it started with those who were bold enough to take on the DNF, but something was wrong, they were all weepy, how they prepared so much and yet could not complete it! And then it was my turn, when I narrated them about the difficulties and finally been able to somehow manage the registration, they were all holding their tummies and laughing away, and I shared that even if it is DNF, I take back a whole new renewed self from here, I take back astonishing stories of people dealing with extreme endurance and overcoming the challenge. Somewhere I felt I was mentally stronger than them, which I had to be since I was under prepared. Later people came to me and acknowledged that they felt lighter when they laughed at my speech. I had a sense of pride for what I did out there, I was the only participant to continue and Finish on day 3 out of all those who had a DNF on day 2.